Bruce Maccabee, PhD (optical physicist) has researched the UFO subject for decades and published several studies on his personal website and elsewhere, e.g. UFO acceleration. He uncovers several important historical cases. [off-line since Feb-2008, linked via Wayback Machine] temporaldoorway.com/ufo/ scientific study of UFOs, by Mark Cashman Director of MUFON CT, has some unique material. Includes a Collections Of UFO Cases, Evidential UFO cases, a Summary Of The UFO Phenomenon much like this document and a critique of the Paranormal UFO Theories of Vallee and Keel. CanadianUFOReport.com Chris Rutkowski and Geoff Dittman. www.isaackoi.com Isaac Koi (pseudonym) British UFO researcher. triangularufos.com focuses on UFO triangles, inspired by a sighting over Wisconsin USA in 2007. Stanton T. Friedman trained as a nuclear physicist and worked over a decade in his academic specialty (shielding of nuclear aircraft and rockets, powered by fission and fusion). Since the 1970s became full-time UFO investigator, paid UFO lecturer and prominent ETH evangelist (ref: The Case for the Extraterrestrial Origin of Flying Saucers (.PDF 57KB) (1995)). He has also co-authored 2 books "Crash at Corona" about the Roswell incident and "Top Secret MAJIC" about the MJ12 papers. Jacques F. Vallee PhD (astronomy, computer science) researcher and author, papers on UAP. List of discredited UFO sightings from *U* UFO Database by Larry Hatch -- although it includes some arbitrary "explanations", e.g. the 1976 "UFO cross" by 2 policemen. Note: the original website www.larryhatch.com is down, as its author had a health issue in 2006 and is now recovering. 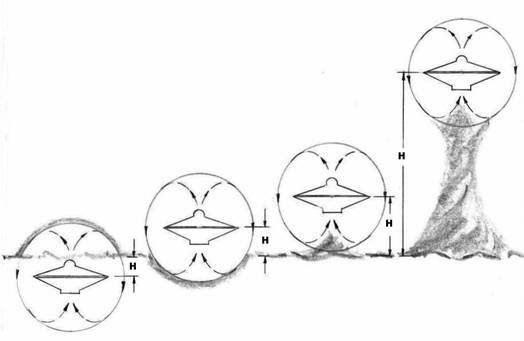 UFO investigator course: 2nd edition of UFO STUDY UFO_Study_P1_V151.pdf intended to be the replacement for BUFORA's outmoded "UFO Investigation"
Auguste Meessen Belgian Ufologist, formulated a "Pulsed EM Propulsion" model. It involves the action of electric and magnetic fields on electric charges, resulting from an adequate ionization of the ambient air. He also shows how the required, extremely intense, but low frequency field can be produced. Dr. James Deardorff research site on "Talmud Jmmanuel" and UFO-biblical connections. He presenting his case about Jesus Christ as a real historical person and ET contactee. Note: Deardorff embraces the controversial "Billy Meier" Swiss contactee case, which nearly all UFO researchers consider a crude hoax. Nick Pope was responsible for UFO reports and associated public correspondence for three years (1991-94) during his career at the UK Ministry of Defence. PRUFOS UK un-official database for serving and retired police officers in Britain. policeufo.com Australian police officers website. Animal Pathology Field Unit (APFU) established in 2001 and is a non-profit making organisation committed to carrying out serious research into the animal mutilation mystery. Claude Poher, PhD in 1977 created and headed GEPAN, the official French UFO project at CNES. ufopop.org UFOs in popular culture (comics, books, magazines). The Why? Files (UK), a bit confusing to navigate in the site and find info, but offers a very good collection of up-to-date material, photos, videos and stories, e.g. on "black triangles". UFO historian Richard M. Dolan's articles & essays, What are the Triangles? Faded Disks Audio Archive of UFO History by Wendy Connors. Preserving audio interviews from the first 3 decades (1950s - 1970s) of the UFO phenomenon. stargate-chronicles.com by Clark McClelland, former ScO, Space Shuttle Fleet, Kennedy Space Center, Florida (1958-1992). His stories about UFOs, which he has studied for 50+ years. ufos: the military unmasked presents the case of UFOs (and actions attributed to them, such as cattle mutilations) etc actually being clandestine operations by the military of USA, to maintain a "ET threat" for military-industrial complex profits after the WWII arms reduction. The author presents the case that UFOs are actually deceptions - luminous projections, generated by e.g. plasma technology, particle beam and laser weapons. I think that, although per the "Disclosure Project" there probably is a rogue group inside the US military carrying out clandestine operations and blaming it on "ETs", most of the author's speculations simply don't fit (all of) the UFO evidence and especially the chronology of events. [off-line / defunct? ]www.ufoartwork.com by Matthew Hurley. An interesting compilation of around 60 paintings and sculptures, from prehistoric to medieval times, which could be interpreted as depicting UFO and spacemen-type images. The site also includes UFO photographs from before 1947 (when the UFO phenomenon is often described as having begun) and some probably hoaxed and misunderstood images. Art historian Diego Cuoghi rebuttal: ART and UFOs? No thanks, only art... a skeptical view at various artwork which some claim depict UFOs seen in ancient times. TinWiki.org "tin foil hat" Wiki, sponsored by "Above Top Secret" to consolidate info from thousands of posts. Wish-list: Preservation of UFO history. TBV scan/OCR and offer online material (newsletters, papers etc) from 1950s-1970s: NICAP, APRO, FSR, FadedDiscs.